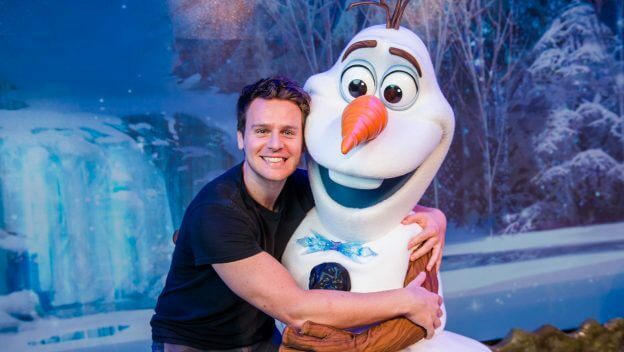 Jonathan Groff, the voice of Kristoff in “Frozen,” stopped by Walt Disney World to visit his pal, Olaf. Groff also stars in “Olaf’s Frozen Adventure,” a featurette screening before Disney-Pixar’s “Coco.” In the “Frozen” follow-up, Anna and Elsa realize they don’t have any family holiday traditions. To remedy this, Olaf and Sven embark on a hilarious journey through Arendelle to find the perfect holiday traditions for the sisters. “Olaf’s Frozen Adventure” begins screening with “Coco” on November 22.